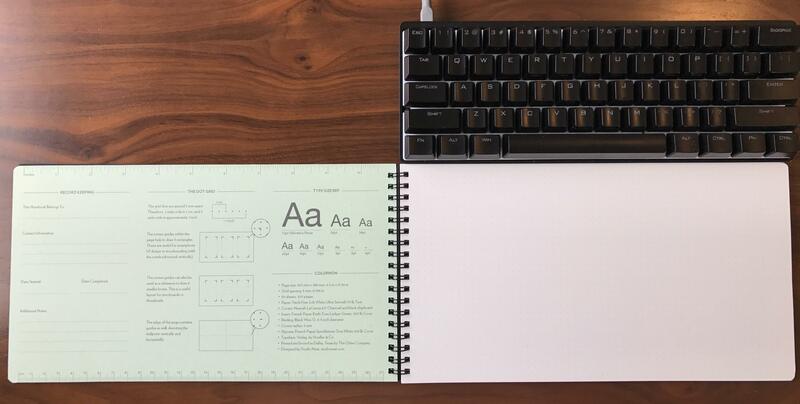 At the beginning of May, I received a notebook from Studio Neat — they told me the idea was to create a great notebook for use on your desk, along side (or rather in front of) a keyboard. In other words to create something long and short, not tall and narrow. I was on board. The biggest issue with most notebooks, like the Baron Fig, is that it cannot easily fit in the gap between your keyboard and the edge of the desk. The Panobook solves this problem, and then some. Since getting mine (a pre-production sample for review purposes, so I paid no money) I’ve been using it everyday. Initially, I used it to test it out, but I kept using it because it’s great. Take close note of the dot grid specs there, because Studio Neat has buried some clever features into a simple dot grid. For instance, there’s a quick way to make a box for iPhone designs, quick methods for dividing the page in half, or into quarters. They didn’t slap a grid on the page and call it a day, they gave it thought — how could it be as useful as possible to the widest range of people? And the paper, I’m not a huge paper nerd, but this paper is stellar. Studio Neat says it is “Finch Fine Soft White Ultra Smooth 70 lb Text” and sure it feels just like that… I guess. The truth is: my ink dries fast, doesn’t smear (I am left handed, that’s a big issue), doesn’t bleed through the back side, and my pen glides well over the surface. What more could you ask for? Not much. I have a small box in my office filled with used and unused notebooks. There’s this odd thing which happens when you fill a notebook, it’s both satisfying and annoying. You feel like you can’t throw it out, there’s important stuff there, yet what are you to do with it? 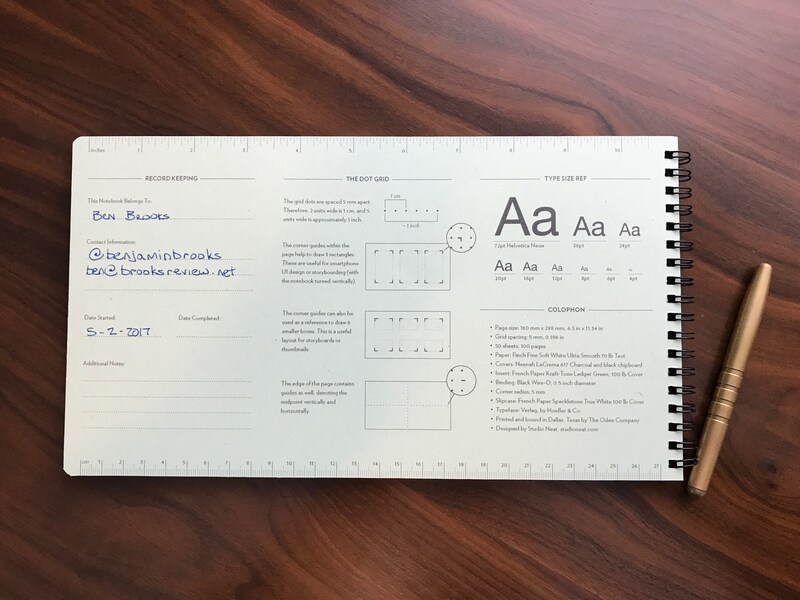 Studio Neat has thought this through, they’ve provided you with a slipcase for the notebook, which allows it to be archived for later reference. It’s a neat touch, but a problematic one: where do you store the slipcase while you are using the notebook? Still, this is the level of detail I’ve come to expect from Studio Neat and they came through with a well planned slipcase. This is easily the largest notebook I have ever used, with the real estate for the page being closer to the size of my 12.9” iPad Pro than any other notebook I have. The landscape orientation of it also poses unique challenges. However, even for someone who doesn’t “draw”, I’ve found this format to be quite freeing. There are some days, or rather some calls, where I will run two columns of notes on one page. Which is about as logical as you can use for notes on this style of a notebook. What’s more interesting is the days when I find uses for the page I could not otherwise achieve with a more traditional notebook. Often I find taking notes pinned to the left edge of the pad, and then expanding upon those thoughts, or tying them together with many terrible arrows and such leading to yet more thoughts on the right side. Or days where I might list out some things I need to do around the house on the right edge as I work, and keep my running notes on the left side. Where my notes in a Baron Fig look relatively neat and tidy, my notes in a Panobook look wild, loose, and free. I’d say it set my note taking free, but that seems awfully pretentious to say. 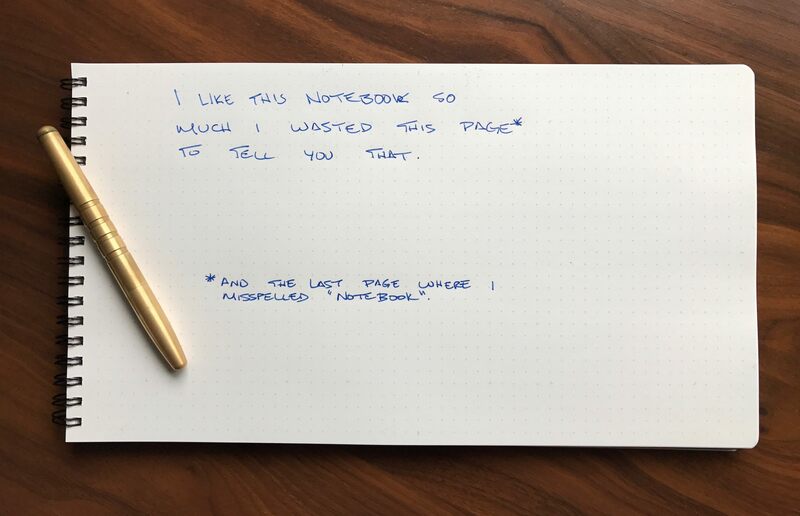 This isn’t a notebook, it’s more like a note canvas. Simply put: I love this notebook. It’s not one you take with you, it’s a statement to keep on your desk. To archive in your bookshelf when it’s pages are full of history. It fits perfectly in front of my keyboard. Even though it is spiral bound, and I am a lefty, it’s given me no issues. This notebook is the reason I bought a special pen to keep on my desk with it. Back it, buy it, support it — whatever — just get one. I have no interest in keeping any other notebook on my desk. What if someone took a normal notebook, and made something which works well with a computer on your desk?